An insect like mechanized overseer and protector of the huge fuel plants run by a mysterious industrial race of creatures. The GUARDBOT is incredibly fast and maneuverable for a mid size ship, switching at will between normal free-drift and strafe-lock movements to lay down tons of firepower at dangerous angles. 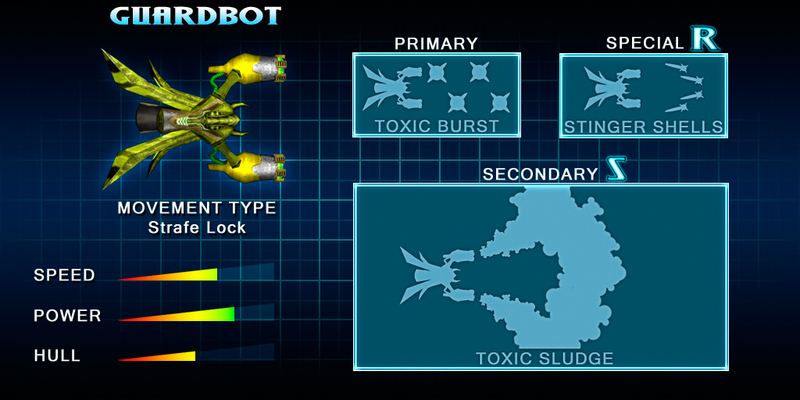 In the Toxic Sector and other toxic sections of space, the GUARDBOT can travel at full speed through the toxic sludge that slow and burn enemies giving this creature serious home field advantage!